You know those internet memes that contain ridiculously long Finnish words to scare people off? Well, I can tell you that if you learn Finnish, long words will be the least of your worries – there are lots of difficult bits in learning this language, but that’s not one of them. And how surprised are you if I tell you that Finnish language consists largely of very short one- or two-syllable words? There are some with three syllables as well, a few with more than that, but the vast majority has one to two. 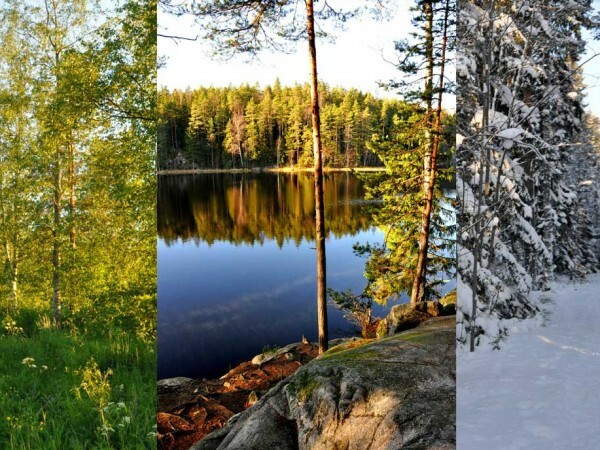 The very much recommended blog “Random Finnish Lesson” has several posts that show the simplicity of Finnish words: 100 very common words, Two-letter words, Words with one Consonant and a long Vowel. A sentence in Finnish may well look like this: “Yötyö on ohi jo, oi, se on iso ilo!” Nightshift is over already, oh, this is a great joy. So how come you can find monstrosities like metsämansikkajäätelöjuhlapöytä? Well, those long words are simply many small single words lined up to mean a more complex thing. This is not a purely Finnish phenomenon but possible in some other languages as well. For example in German, I have no problems creating the word “Holzparkettfußbodenschleifmaschinenverleihgeschäftsschaufensterputzausrüstung”, and it’s perfectly clear and valid to a native speaker (and trust me, it’s a lot harder to pronounce than anything that Finnish will ever throw at you!). It’s just that it’s very, very specific. The same applies in Finnish: You can create ridiculously long words, but the longer it gets, the more specific a thing is and you’re actually unlikely to encounter it anywhere at all. It’s not just a table, it’s a woodland strawberry ice cream party table (metsämansikkajäätelöjuhlapöytä). If you tried the same in any other language, you would in most cases result in even longer word, as the base words are longer to start with (compare 30 letters for metsämansikkajäätelöjuhlapöytä to 36 for woodlandstrawberryicecreampartytable). Similar: hääautoöljyalijäämä – “shortage of wedding car oil” which is 19 vs. 23 letters, or alkusyysmaatyöraesää, which I can’t even translate directly, but it’s roughly “hailstorm weather that farmes want in early autumn”. Then there’s of course the famous kalsarikännit – “getting drunk alone at home in your underwear” 13 vs. 38 letters, although I guess this is cheating a bit since it is not a direct translation of the word components. The green line shows the length of Finnish words, while the other two lines refer to English: The blue line includes all words, the orange line is filtered to not include prepositions, as they don’t exist in Finnish language and therefore skew the whole picture a bit, since they are the most used words overall and usually quite short. The dotted lines show the average word length, which in Finnish is 5.76 letters, roughly one letter more than in English without prepositions 4.73. Average word length in English including prepositions came out as 4.21. The Finnish language has a thing called “vowel harmony”, which means that a single word can only contain vowel group auo or group äyö (e and i can appear in either of those). If a word has vowels from both groups, you already know that it is a compound word. Sometimes the abundance of vowels in Finnish words may look daunting, but it can actually be a helpful thing to read words like “alkusyysmaatyöraesää“, “metsämansikkajäätelöjuhlapöytä” or “hääautoöljyalijäämä“, where it is easy to find out where one word ends and the next one begins because of the vowels in it: alku|syys|maa|työ|rae|sää, metsä|mansikka|jäätelö|juhla|pöytä and hää|auto|öljy|ali|jäämä. Of course, not all compound words are nice like that, to only have alternating vowel groups, there may be two or more words in a row that use the same group of vowels, like in ratsastajapatsaskatsastaja (inspector of the equestrian statue). If a part of a compound word starts with the same letter as the previous ends, you have a hyphen in between to show where one word ends and the other one starts, as otherwise the letters would flow into each other: Auto-onnettomuus is a car accident. Finally, just read the word one letter after the other. In Finnish, every letter is pronounced, and it is always pronounced the same way. No funny business like “enough women were queuing for choir” where letters are randomly skipped or pronounced differently than they should. If you encounter a doubled-up letter, just hold it for double the length, or speak two of them with a little break in between for plosives (kk, tt). Pronouncing doubled vowels correctly can be a life-saver: tapaan sinut – I meet you, tapan sinut – I kill you – but no pressure ;). Hey, just discovered your blog and wanted to like your Facebook page but the link under your article is not working and just by searching your blog name I don’t find it…? Hi, I’d like to clarify the rule in the second last paragraph a bit. A hyphen is added between compound words only when the words end and start with the same vowel. No hyphen is added, if the same letter happens to be a consonant. Trotzdem, du hast ein sehr gut Blog, ich finde das sehr interessant!